Here’s the cake that Katie made for me this year. I knew she was to be my wife when she made me my first birthday cake back in June, 1998, as this also marked the return of celebratory birthdays to my life. This year’s cake was a yellow cake with chocolate butter-cream frosting and the fancy decorations seen here. There’s also a closeup of the “31” from the top of the cake over on Flickr. 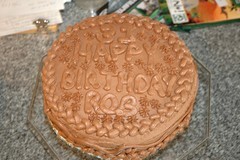 I’ve got some other pictures of cakes from years past that I’ll upload at some point shortly. The carrot cake from 2003 still takes the.. umm.. cake for best decorations, and Katie’s carrot cake will truly mess you up (in a good way). Hypertext Jockey, Proudly powered by WordPress.